Of the world’s population, one in a hundred is a wine grower, wine maker or wine merchant. Of all the cultivated land in the world, roughly 1 acre in every 130 is a vineyard. Wine production is only viable in the temperate bands between latitudes 30o and 50o in each hemisphere. In the southern hemisphere this picks up the southern tips of South America, South Africa, Australia and New Zealand. This band is responsible for a tiny minority of the world’s wine but the vast majority of the wine now drunk in the UK. The reason for this imbalance is simple: over 80% of wine sold in the UK today is through the big supermarket chains. Their criteria are price and the ability to churn out huge volumes manufactured to suit the taste of the moment. This means production has to be industrial rather than artisan. Vineyards in Europe are increasingly moving back to traditional farming methods, some completely organic, some biodynamic, most at the least sustainable. They recognise the need to forego short term gains in order to provide a heritage for their children. They are also considerably closer to us in the UK. The brands we see in supermarkets are mainly from 3 multinationals who now account for 90% of Australian wines. They don’t grow grapes; they buy in from vast prairies where there is hardly a blade of grass and no wildlife due to heavy spraying with herbicides and insecticides. The baron earth is fed with artificial fertilisers and irrigated heavily. Everything is done by machine. Cost is everything. There is a clear understanding of the difference between a free range turkey and a Turkey Twizzler but little recognition of the difference between real wine and industrial wine. Avoid Gallo (they boycott it regularly in the States). Avoid anything from Constellation Brands. Choose wine bottled by the producer. Instead of buying two bottles of industrial wine, buy one bottle of decent wine. 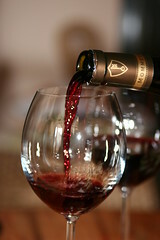 Take as much time to learn about real wine as you would about the food you eat.